AP Pricing Tables is a feature-rich WordPress plugin with an intuitive interface which allows you to create powerful pricing tables on the go. You get 35 predesigned templates and limitless options. Even non-coder can design a stunning pricing table in no time with this easy-to-use plugin. It allows you to create unlimited pricing tables with unlimited rows and columns. In addition these features, you can define column border radius, column width, column space, configure ribbon for each column and much more. Customize your pricing table to the most and give a desirable figure! This plugin enables you to add audio, video and google map as well in the content. Create a visually appealing pricing table quicker than ever. 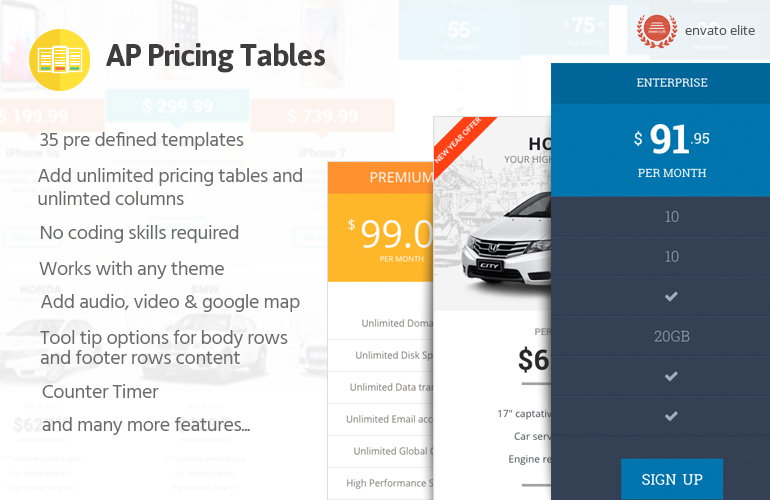 A perfect WordPress plugin to create powerful pricing tables! Hey Buddy!, I found this information for you: "Responsive Pricing Table Builder for WordPress – AP Pricing Tables". Here is the website link: https://access-keys.com/wordpress-plugins/ap-pricing-tables/. Thank you.